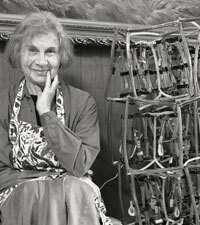 Beginning in the early 1990’s Bea began making sculptures based on her fascination with topology and the Mobius strip. Mitchell’s lilting half-twist sculptures have a special grace and freedom. Constructed from materials as various as cast stainless steel, jute, and found objects, they seem to fold subject matter and materials into themselves, suggesting melodic variations and recurring life themes. Bea Mitchell has always been an artist in one way or another. She grew up making finely-tuned connections between line and tone, color and love. Ironically, a roundabout path eventually brought her to sculpture and to the playfully geometric, fast-moving abstract paintings for which she is known today. Bea Mitchell was born in Cleveland, OH in 1931 and attended the Cleveland Institute of Art where she received her BFA in 1980. She has had her work exhibited across the country as well as all over the world including: The Cleveland Museum of Art; The Sculpture Center in Cleveland; the Artists Archives of the Western Reserve; Kanagawa, Japan; and Bangalore, India. Her work is also a part of art collections at the Portland Art Museum and the Henry Ford Hospital.